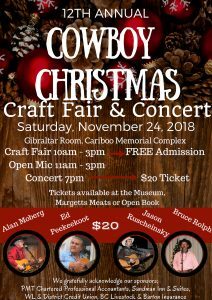 The Museum of the Cariboo Chilcotin invites you to attend the 12th Annual Cowboy Christmas Craft Fair & Concert. Held November 24, 2018 at the Gibraltar Room, within the Cariboo Memorial Recreation Complex of Williams Lake. Come and see the various vendors featuring local artisans and crafts, and enjoy great music at the concert. Kids activities and silent auction! Concert begins 7pm – Concert tickets are $20 each and available for purchase at the Museum, Margetts Meats or the Open Book! Evening concert performers include Alan Moberg, Ed Peekakoot, Jason Ruscheinsky and Bruce Rolph. November 24th is a busy weekend for craft fairs in Williams Lake! 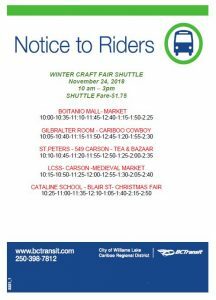 Check out the shuttle schedule created to tour you around to all the craft fairs, saving you the struggle of finding parking! Making Christmas shopping easy!